"A perfect kiss?" Joanna Lennox knew there was no such thing. Of course at twenty years old, she was unkissed, uncourted and utterly alone. But that was about to change as a Scotsman came into her library and kissed her senseless! What? Oh yes, talk about a story grabbing hold in the first few pages!! 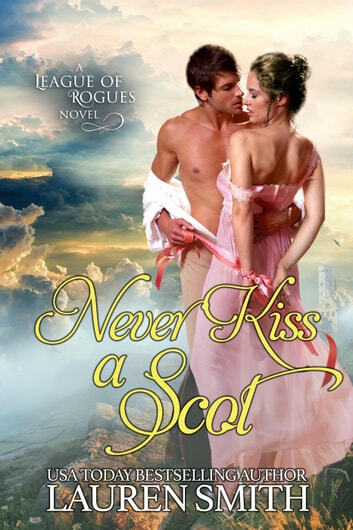 Then, a broodingly handsome, dangerous Scot, Brock Kincade, who was the brother of her future sister in law, stepped into her life and changed everything! What could be better than a handsome Scot and one who asked her to marry him? But what about love? A delicious, sigh worthy story that I could not put down once I started. Other characters in the League made their appearances, of which Joanna's brother was a member. Prepared to be enchanted and even a little emotional as Joanna and Brock (yes one of my favorite names!) try to find their happy ever after!! Two badgers, three Scottish brothers, one villain, five dances, two weddings, three highwaymen -- there's a lot going on in this story and it's all woven together masterfully into a well-paced, emotionally charged romantic adventure with plenty of steam, a few laughs and a delightful array of characters. Joanna is everything she should be to have her choice of suitors: well bred, moneyed, lovely, and agreeable. But after three seasons, no one has shown any interest, and it makes no sense. In what might be one of the best first meeting scenes ever, the rugged laird of the Kincades practically steps out of Joanna's gothic romance novel and gives her the perfect kiss she'd been dreaming about. Following her heart will test Joanna -- her patience, her priorities, her physical and emotional strength. Watching her grow beyond her expectations is glorious. Special kudos for the cover. It's dreamy and romantic and gives a gentle nod to clinch covers of the past while still looking modern. I especially like the detail of the ribbon stretched between their hands.